Apollo Milton Opeto Obote (December 28, 1925 - October 10, 2005), Prime Minister of Uganda from 1962 to 1966 and President from 1966 to 1971 and from 1980 to 1985, was a Ugandan political leader who led Uganda to independence from the British colonial administration in 1962. As a student he was expelled from Makerere University, of which he was later Chancellor, for taking part in a strike. Moving to Kenya, he became involved in the Kenyan independence struggle, which prepared him to return to Uganda to start a branch of the Ugandan National Congress and assume a prominent role in the independence movement. Unlike in Kenya, this was a peaceful struggle. After engineering a strategic alliance with Mutesa II of Buganda's royalist party, he entered the Legislative Council in 1957. Following independence, the alliance won the 1962 election. He became Prime Minister while Mutesa was appointed President. In 1966, he removed Mutesa from the Presidency, and, having appointed Idi Amin as army chief, suspended the constitution. Pursuing broadly socialist policies, which made him unpopular among European leaders, he moved towards a one-party, centralized state. He abolished provincial government and also the traditional kingdoms, including that of his former ally. His personal lifestyle and lack of real progress under his rule alienated many Ugandans. While attending a meeting of the British Commonwealth in 1971, he was overthrown by Idi Amin, whose oppressive rule ended in 1980. Obote spent the intervening years in Tanzania as the guest of his friend, Julius Nyerere. Following Amin's fall, he again stood for the Presidency and won. The fact that Nyerere had troops stationed in Uganda may have contributed to a his electoral success. Allegations of voting fraud were rampant. His second rule was marred by repression, which reached greater heights than it had during his first term. Many civilians died as a result of the Ugandan Bush War. He did negotiate help from the World Bank and the International Monetary Fund but his attempts to crush the opposition coalition, the Ugandan Popular Front, ended in a guerrilla war between government forces and the National Resistance Army. In 1985, as a presidential election approached, he was toppled in a coup. He went into exile, living in Zambia and South Africa. Partly due to weak democratic foundations, a legacy of colonialism and party due to lack of a tradition of service in the public interest, Obote was a victim of personal ambition. He deluded himself that he was always right and that what was good for him was automatically good for Uganda. Milton Obote was born at Akokoro village in Apac district in northern Uganda. He was the son of a local chief of the Lango ethnic group. He began his education in 1940, at the Protestant Missionary School in Lira, and later attended Gulu Junior Secondary School, Busoga College and eventually at what later became Makerere University studying English, economics and politics. At Makerere, Obote honed his natural oratorical skills, but was expelled for participating in a student strike (Obote claimed he left Makerere voluntarily. He worked in Buganda in southern Uganda before moving to Kenya, where he worked as a construction worker at an engineering firm. He tried to obtain grants to study overseas but was unsuccessful. While in Kenya, Obote became involved in the Kenyan independence movement. After returning to Uganda in 1956, he joined the political party Uganda National Congress (UNC), and was elected to the colonial Legislative Council in 1957, having formed a local branch of the party. In 1959, the UNC split into two factions, with one faction under the leadership of Obote merging with Uganda People's Union to form the Uganda People's Congress (UPC). In the run up to independence elections Obote formed a coalition with the Buganda royalist party, Kabaka Yekka. This alliance was strategically significant because the Baganda were wealthy and numerous but "wary of being absorbed into a state which might be dominated by their traditional enemies in the north and west of Uganda" and Obote was from the North. With Bagandan support, his own position was considerably strengthened. The two parties controlled a Parliamentary majority and Obote became Prime Minister in 1962. In the election, Mutesa's party won 21 seats while Obote Peoples Congress won 37. Other parties won 33, which gave the alliance a majority. Obote assumed the post on April 25, 1962, appointed by Sir Walter Coutts, then Governor-General of Uganda. The following year, the position of Governor-General was replaced by a ceremonial Presidency to be elected by Parliament. Mutesa, the Kabaka (King) of Buganda, became President, with Obote as executive Prime Minister. As prime minister, Obote was implicated in a gold smuggling plot, together with Idi Amin, then deputy commander of the Ugandan armed forces. When the Parliament demanded an investigation of Obote and the ousting of Amin, he suspended the constitution and declared himself President in March 1966, allocating to himself almost unlimited power under state of emergency rulings. Several members of his cabinet, who were leaders of rival factions in the party, were arrested and detained without charge. In May the Buganda regional Parliament passed a resolution declaring Buganda's incorporation into Uganda to be de jure null and void after the suspension of the constitution. Obote responded with an armed attack upon Mutesa's palace, which ended when Mutesa was forced into exile. Obote had ordered Amin to storm the king's palace. The relationship between the two men had already broken down, with Mutesa cultivating the support of the army chief, Shaban Opolot whom Obote removed, promoting Amin. In 1967, Obote's power was cemented when Parliament passed a new constitution which abolished the federal structure of the independence constitution, and created an executive Presidency. Moehler points out that the parliament at this time mainly comprises members of the UPC whose terms had expired, so had no legitimacy or legal authority. Obote set about dismantling the traditional kingdoms, removing any rival to his own authority. When he convened parliament to promulgate the new constitution, he surrounded the chamber with soldiers and informed members that they would find copies of the constitution in their mail boxes. Commenting on the difference between the 1962 and 1966 constitutions, Mutibwa describes the first as characterized by "compromise, tolerance and pluralism" and the second by "anger and unitarism." In 1969, there was an attempt on Obote's life. In the aftermath of the attempt all opposition political parties were banned, leaving Obote as an effectively absolute ruler. He set up a personal security service to surround himself with the protection he needed to survive real and imagined assassination plots. The years of Obote's rule as President from 1966 to 1971 were on the whole quiet years in Uganda's history. A state of emergency was in force for much of the time and many political opponents were jailed without trial, but life for ordinary citizens was comparatively uneventful. Some economic growth occurred, although this was not spectacular. His one-party rule displeased overseas donors while lack of substantial progress at home began to alienate the people, as did his extravagant personal life-style. 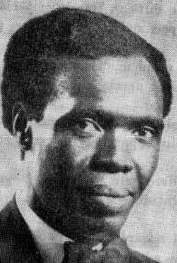 After receiving several honorary doctorates, he started styling himself "Dr." In 1969-70, Obote published a series of pamphlets which were supposed to outline his political and economic policy. "The Common Man's Charter" was a summary of his approach to socialism. A proposal on new election procedures was supposed to end tribalism (allegiance and favoritism for one's own ethnic group. The government took over a 51 percent share in major private corporations and banks in the country in 1970. After 1966, Obote's regime was openly dependent on control of the army. Idi Amin, who sided with Obote in 1966, was rewarded by promotion to Army commander, despite his near-illiteracy and the availability of trained officers. Starting in 1969 strains became visible between the two. In January 1971 Obote was overthrown by the army while attending a Commonwealth conference in Singapore, and Amin became President. Published works on the coup have asserted that Western Governments were at least aware of, and may have aided, the coup in the context of Cold War politics and the "red threat." Obote fled to Tanzania. In 1979, Idi Amin was ousted by Tanzanian forces aided by Ugandan exiles. By 1980, Uganda was governed by an interim Presidential Commission. At the time of the 1980 elections, the chairman of the commission was a close associate of Obote, Paulo Muwanga. Muwanga had briefly been the de facto President of Uganda from May 12 to May 20, 1980. Muwanga was the third of three Presidents who served for short periods of time between Amin's overthrow and the setting up of the Presidential Commission. The other two presidents were Yusuf Lule and Godfrey Binaisa. The elections in 1980 were won by Obote's Uganda People's Congress (UPC) Party. However, the UPC Party's opposition believed that the elections were rigged, which led to a guerrilla rebellion led by Yoweri Museveni's National Resistance Army (NRA) and several other military groups. The Tanzanian forces were gradually withdrawn, possibly because Uganda was unable to repay the expensive cost of their intervention, estimated as $600 million. Approximately 100,000 people died as a result of fighting between Obote's Uganda National Liberation Army (UNLA) and the guerrillas. Amnesty International and the Red Cross reported numerous Human rights violations. Obote did negotiate funds from the World Bank and the IMF agreeing to increase agricultural production and even he invited political exiles and Asians to return to Uganda and repaired strained relations with other African states. The terms he agreed with the IMF, though, included devaluing the currency, which effectively wiped peoples' savings out overnight. This may have indicated his growing self-confidence; he allowed his opponents to form themselves into a united anti-UPC Popular Front. Soon, the UPF had an armed wing, the Ugandan Resistance Army and the guerrilla war broke began. On July 27, 1985, Obote was deposed again. As in 1971, he was overthrown by his own army commanders in a military coup d'état. This time the commanders were Brigadier Bazilio Olara-Okello and General Tito Okello. The two men briefly ruled the country through a Military Council, but after a few months of near chaos, Museveni's NRA seized control of the country. After his second removal from power, Obote fled to Tanzania and later to Zambia. For some years it was rumored that he would return to Ugandan politics. In August 2005, however, he announced his intention to step down as leader of the UPC. In September 2005, it was reported that Obote would return to Uganda before the end of 2005. 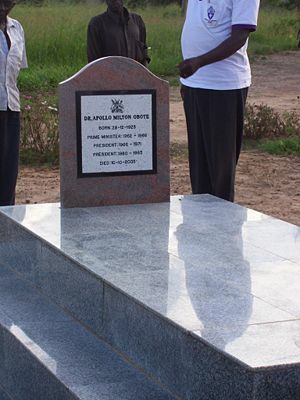 On October 10, 2005, Obote died of kidney failure in a hospital in Johannesburg, South Africa. Milton Obote was given a state funeral, attended by president Museveni in the Ugandan capital Kampala in October 2005, to the surprise and appreciation of many Ugandans, since he and Museveni were bitter rivals. Other groups, such as the Baganda survivors of the "Luwero Triangle" massacres during the civil war, were bitter that Obote was given a state funeral. He was survived by his wife and five children. On November 28, his wife Miria Obote was elected UPC party president. One of his sons, Jimmy Akena, is a member of parliament for Lira. When Obote rose to power, he was a "charismatic politician" who seemed to personify the hopes of the young nation, even of the whole of Africa. Uganda had achieved independence without an armed struggle and with an economy in place that, at the time, was relatively healthy. Although the commercial sector was dominated by South Asians, there was "no alien white settler class attempting to monopolize the worth of the cash crop economy" and "In Uganda, it was African producers who grew the cotton, the coffee that brought the highest standard of living" said Akbar Godi, a Ugandan member of parliament on the country's 45th anniversary. In fact, the country seemed to be "a model of stability and progress." What went wrong? Idi Amin constantly blamed the British for Uganda's problems. On the one hand, Uganda was well situated to thrive economically, which makes it difficult to blame the departing colonial power for the ruined economy that followed independence. In fact, the British had deliberately encourages an African-led agricultural sector. Leaders such as Obote, once in power, spent more on the military, on personal security and on suppressing opposition than they did on education, health care and agricultural development. At the same time, they lived an extravagant lifestyle. What can be laid at the blame of the departing colonial power was that the British did not properly prepare people such as Milton Obote for leadership. The British had established a legislative council in 1921 but the membership, which was appointed, consisted of whites and Asians and it was not until the 1940's that the first three Africans were nominated. The Northern province was ignored, while the Baganda were given a permanent seat. Instead of members on the Council regarding this as a privilege, it was seen as a right. Nor did members see their role as one of self-less service to promote the good of the whole state; they aimed to protect the interests of their own province, or clan. Mutibwa identifies a personality change in Obote after his rise to power, which transformed him from a "frank and sincere" man into someone who believed not only in the his "own destiny" but also in the "rightness of everything he did." He could not tolerate dissent, or opposition. The repressive measures he took stemmed from this personality transformation. His centralization of governance and attempts to end the autonomy and power of local elites, was also influenced by the ideas of Kwame Nkrumah who believed in dismantling the traditional institutions, such as the Kingdom of Buganda, that in his view would hinder the development of national unity. Obote spoke about "One Nation, One People, One Parliament." Where he went astray was in his conviction that he symbolized the nation, the people and parliament. He systematically dismantled the traditional kingdoms of Buganda, Ankole, Bunyoro and Tore removing any rival to his own central authority. Genuine, pluralist democracy was not given a chance to flourish. If the British had nurtured and fostered a tradition of public service, a more solid foundation would have existed on which the post-independence leaders could have built. Once in office, the attraction of being a head of state and of living extravagantly was too great to resist. In 1963, Obote was awarded an honorary Doctor of Law from Long Island University in the United States and in 1964 he received the same degree from the University of Delhi, India. After this, he always styled himself "Dr." When Makerere, founded as a College in 1922 was upgraded to a University in 1970, Obote became its first Chancellor. When Amin took over, he appointed himself Chancellor but Obote was reinstated from 1981-1985. Both men enjoyed the status of "Chancellor" but neither did much to develop the University, dubbed the "Harvard of Africa." During the 1970s the buildings were neglected and from 1978 until 1986 the medical school lost recognition from the United Kingdom General Medical Council. ↑ Yoga Adhola, The Roots, Emergence, and Growth of the Uganda Peoples Congress, 1600-1985, UPC Website. Retrieved December 23, 2008. ↑ The Times, Milton Obote. Retrieved December 23, 2008. ↑ African Elections Database, Elections in Uganda. Retrieved December 23, 2008. ↑ 5.0 5.1 Mutibwa (1992), 58. ↑ Radio Rhino, The common Man's Charter. Retrieved December 23, 2008. ↑ Bark (1988), 185; Avirgan and Honey (1982), 12. ↑ CIA, CIA Factbook—Uganda. Retrieved December 23, 2008. ↑ Xinhua, Uganda's exiled ex-president Obote to retire from party's presidency. Retrieved December 23, 2008. ↑ People's Daily Online, Uganda's exiled ex-president to return home before end of 2005. Retrieved December 23, 2008. ↑ 13.0 13.1 BBC, "Former Ugandan leader Obote dies." Retrieved December 23, 2008. 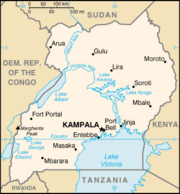 ↑ Peter Clottey, Uganda Celebrates 45 Years of Independence Today, Voice of America. Retrieved December 23, 2008. ↑ Chege Mbitiru, Makerere University—Kampala, Associated Press. Retrieved December 23, 2008. Adoko, Akena. 1983. From Obote to Obote. New Delhi, IL: Vikas Pub. House. ISBN 9780706922622. Anguria, Omongole R. 2006. Apollo Milton Obote: What Others Say. Kampala, UG: Fountain Publishers. ISBN 9789970026166. Avirgan, Tony, and Martha Honey. 1982. War in Uganda: The Legacy of Idi Amin. Westport, CT: L. Hill. ISBN 9780882081373. Bark, Dennis L. 1988. The Case of Africa. The Red Orchestra, v. 2. Stanford, CT: Hoover Institution Press, Stanford University. ISBN 9780817987428. Collins, Robert O. 1990. Eastern African history. Topics in World History. New York, NY: M. Wiener Pub. ISBN 9781558760165. Gingyera-Pinycwa, A.G.G. 1978. Apolo Milton Obote and his Times. Studies in east African society and history. New York, NY: NOK Publishers. ISBN 9780883570340. Ingham, Kenneth. 1994. Milton Obote. London, UK: Routledge. ISBN 9780415053426. Mittelman, James H. 1975. Ideology and Politics in Uganda: From Obote to Amin. Ithaca, NY: Cornell University Press. ISBN 9780801409462. Moehler, Devra C. 2008. Distrusting Democrats: Outcomes of Participatory Constitution Making. Ann Arbor, MI: University of Michigan Press. ISBN 9780472099931. Mutibwa, Phares Mukasa. 1992. Uganda Since Independence: A Story of Unfulfilled Hopes. Trenton, NJ: Africa World Press. ISBN 9780865433564. O'Cleirigh, Noel. 2004. Recollections of Uganda Under Milton Obote and Idi Amin. Victoria, BC: Trafford. ISBN 9781412024402. This page was last modified on 11 February 2015, at 17:25.